The universal Czechoslovakian cake, called bublanina, varies with the season and the fruit that is available. It's a bit like a coffeecake in texture and is probably why it is sometimes served as a breakfast pastry. Commonly used fruits are sweet cherries, tart cherries, plums, nectarines, apricots, strawberries and blueberries. The name "bublanina" comes from the Czech word for bubble and might refer to the fact that the cake batter bubbles up around the fruit, almost enveloping it. Place rack in center of oven and heat to 350 degrees. Butter or lightly coat with cooking spray a 9-inch-by-9-inch baking pan. In a medium bowl, cream together butter, sugar and yolks until light and fluffy. Add liqueur, if using, and salt, mixing well. In a clean medium bowl, beat egg whites with cream of tartar until stiff. Alternately fold in egg whites and flour into butter-egg mixture. 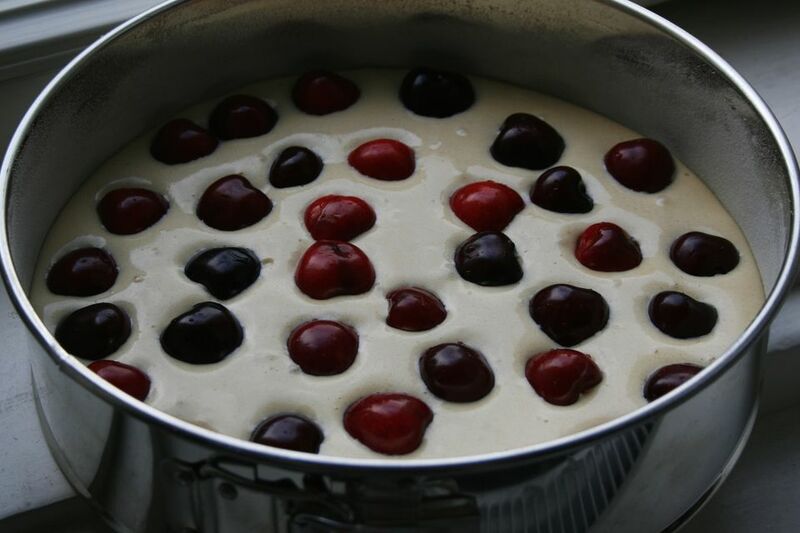 Turn batter into prepared pan and scatter cherries evenly over top. Lightly press down cherries into batter until partially covered. Bake 30 to 40 minutes or until toothpick inserted near center comes out clean. Cut into 6 equal pieces. Serve warm or cold dusted with confectioners' sugar.